Global Green staff members are in Youngstown, OH, today to lead a discussion on urban farming at the Youngstown State University Sustainable Energy Forum and to release a new report, "Urban Agriculture Feasibility Study for Youngstown: Opportunities for Healthy Food Production, Local Jobs, and Ecological Restoration" (PDF). "The goal is to show how urban agriculture provides multiple benefits -- urban revitalization, local jobs, and access to healthy food," said Walker Wells, director of our Green Urbanism Program. Wells, who hopes our work will "encourage greater collaboration among local organizations and further the advancement of urban agriculture in Youngstown, the Mahoning Valling, and other post-industrial cities." 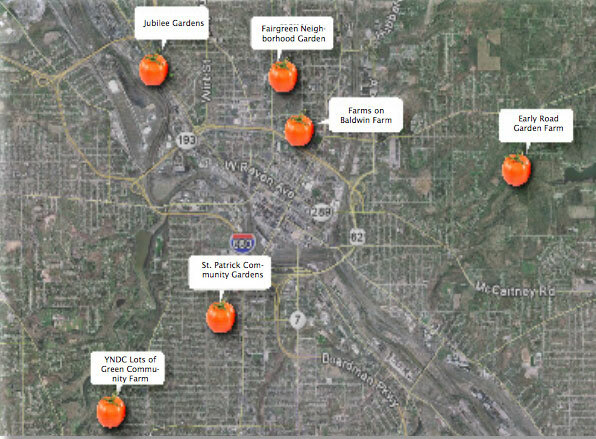 Our report examines the financial feasibility of a commercial urban farm in the Oak Hill neighborhood of Youngstown. We looked at urban farms nationally and explored three urban farming scenarios for a roughly 5.5 acre farm focused primarily on vegetable production, aquaculture, and egg. When fully operational, the farm is projected to generate approximately $166,000 in revenue annually, produce more than $10,000 in profit, and create three full-time equivalent local jobs. Joining Wells: Linda Stone from our New Orleans office; Jamael Tito Brown, Council President, City of Youngstown; Steve Fortenberry, Founder & Board President, Goodness Grows, North Lima, Ohio; Joy Johnson, Grants Management Director, Burten, Bell, Carr Development, Inc., Cleveland, Ohio; Dr. Jim Converse, Market Manager, Northside Farmer’s Market & Co-Founder, Common Wealth Inc., Youngstown, Ohio; Robert N. Brown Director of City Planning, City of Cleveland, Cleveland, Ohio; Brad Masi, Oberlin College Lecturer & Co-Founder, City Fresh, Oberlin, Ohio; Dr. Felicia Armstrong, Assistant Professor, Department of Geological and Environmental Sciences, Youngstown State University, Youngstown, Ohio.